These days we spend so much time striving for perfection, we often overlook the lesser successes, and failures, that should be celebrated. We forget to applaud employees who do their job well and to appreciate the little, everyday triumphs, that make up good practice in our business. Actually it’s more accurate to say, most businesses today do understand the importance of applauding colleagues who do their job well. However, we are too often guilty of reacting in the negative, when an employee gets it wrong. As vital as it is to celebrate the great things we do, it’s as important to appreciate failure. Success often starts with failure. Should we celebrate failure, as well as success? Yes, we absolutely must. Failure forms part of our learning process, which in itself, is something to celebrate. If we can walk away from a failure and say, “I learnt from this experiment”. Then it was worth failing. I am a paradox. I strive for perfection, I congratulate myself for my little triumphs, yet I also scold myself pretty severely, for my failures. Yesterday, I undertook my first Management 3.0 Case Story in Spanish. As my own worst critic, I thought it was a failure. I froze in the moment and so my Spanish didn’t come out how I had planned. Big-time fail as far as I was concerned. I conveyed my anxiety to my colleagues in our Slack channel. My colleague Lisette Sutherland told me to watch a video about Imperfect Action. I won’t talk too much about the video, because I’d like to discuss the topic in more detail. The presenter discussed the fact that it’s better to take action and fail, than not to take action at all. How we learn from every action and each time thereafter, we do it better. After reading that I felt like celebrating my failure. I also learnt that we are not always the best judge of ourselves. This is also a great lesson in our own work-life balance. Striving for excellence, rather than perfection, can help us achieve greater things in all aspects of our life. When is failure not a learning process? If we repeat a failure, it becomes a mistake. It says we haven’t learnt from that failure. And that’s definitely not worth celebrating. The way to get around this repetition of errors, is to focus on actionable ways to improve our ‘failures’, so we don’t repeatedly make the same ‘mistakes’. By celebrating good practices and introducing measures, such as quality checklists, we can avoid this repetition and begin the learning cycle. Success of course, is always worth celebrating. Success teaches us what is good practice, what we can continue doing well and how to improve our systems and methods. A great way to measure success and failure is by using a Celebration Grid. 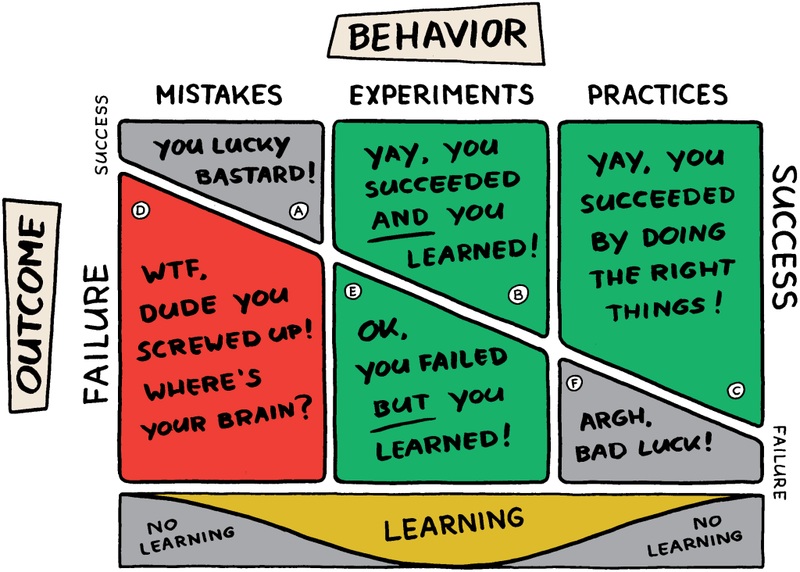 The Celebration Grid measures our behaviour – Mistakes, Experiments and Practices, against the outcome and what we learnt, or did well. To find out if our behaviour led to a positive outcome, we can ask two questions. Jurgen Appelo calls them “yay!” questions. Rather than asking our colleagues what went wrong, we ask them to share what they did well, or what they learnt? We can use the Celebration Grid to measure when success leads to better practice, or when failure contributes to our learning cycle. Both of these situations lead to best practice and continuous improvement in our organization and happy employees! If we make the decision to celebrate success and failure in our company, the first thing we must acknowledge, is that celebration should be consistent. To do this we need to make rules on why and how we celebrate. Celebrate frequently: It’s important to celebrate often and consistently and it’s a great way to motivate your employees on a continual basis. Don’t wait for the daddy of all successes, celebrating a small success every day is fulfilling for your team. Celebrate noticeably: All your team need to be part of the celebration. So don’t just give a hand slap to the team member who did a great job, let everyone know what’s going on. Celebrate remarkably: No handshakes, back slaps, or emails. These celebrations need to remain imprinted on the minds of your team. In Jurgen Appelo’s book #Workout, he talks about a company that installed a ship’s bell in the middle of the office and whenever there was something to celebrate, the employee got up and rang that bell. All the team gathered around the bell and the colleague took a few minutes to explain their reason for celebration. Then everyone ate cake. You could also create a Kudo Wall with Kudo Cards, to thank individuals for their awesomeness. Or get the boss to make the coffee and bring cake for the whole team; although there might be some objection, depending on the number of celebrations you have, or how big the team is! One thought on "Celebrating success and failure"
Thanks for your summary on the celebration grid. Our ship bell just arrived and I’m looking forward how it will work out. Definitely will use the grid in retrospectives soon and I guess it’s an interesting visualization in what area we were active – will be an input for retrospectives too. Experimenting with OKRs – First Quarter Mayhem!